Most people would think that faint trails, tracks, and streambeds (see Bogus Roads Gallery) do not stand a chance of being recognized as "constructed highways." But in 2003, the Bush Administration, through the U.S. Department of Interior (DOI), enacted new rules that would allow many bogus RS 2477 claims to be recognized. The Bureau of Land Management in 2003 published a new "Disclaimer Rule" that directs the agency to review new unsubstantiated RS 2477 claims, above and beyond those claims that were grandfathered when RS 2477 was repealed. The federal government will then "disclaim" ownership, handing over trails to states, counties, or special interests. This rule applies to all public lands, even national parks, monuments, and wilderness. The Southern Utah Wilderness Alliance, together with many organizations and individuals who care about the integrity of public lands, have fought back in court to ensure that bogus highway claims are not turned over to county and state governments on the misguided agenda of local elected officials. Several cases are now pending before the United States District Court for the District of Utah and in the 10th Circuit Court of Appeals, all of which raise hotly contested RS 2477 issues. The 10th Circuit Court of Appeals issued the most influential decision in recent years on September 8, 2005, when it ruled in SUWA v. BLM that Utah, not federal law, guided decisions on the validity of R.S. 2477 claims. As a result, a claimant could obtain an RS 2477 highway by showing ten years’ continuous use (the Utah standard). What this means is still unclear, and we’ll have to wait for further decisions before we know for sure. But Secretary Norton thinks she knows . . . and would apply this dubious opinion westwide, not just in the 10th Circuit. As she left her post in April 2006, she left a going-away gift to her anti-wilderness, pro-development friends: a new policy which makes it easier for RS 2477 promoters to lay claim to countless new highways even in Wilderness Study Areas on routes which the BLM found not to be significant enough to amount to real roads. In the meantime, Bush administration lawyers have dropped lawsuits against counties guilty of grading routes on BLM lands inside the Grand Staircase Escalante National Monument , in Wilderness Study Areas, and on lands where the BLM was conducting a review of wilderness eligibility. They are instead negotiating behind closed doors with these same counties to develop ways in which routes can be recognized as R.S. 2477 highways. In Congress, Rep. Mark Udall has proposed a solution that would provide balanced, reasonable standards to validate RS 2477 claims. His bill, entitled the "Highway Claims Resolution Act," would require any remaining RS 2477 claims to be filed within four years, putting an end to interminable attempts to unravel public lands protection. 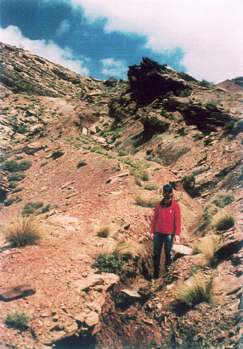 An RS 2477 claim in the San Rafael Swell.